Who’s ready for a loooong Labor Day Weekend? 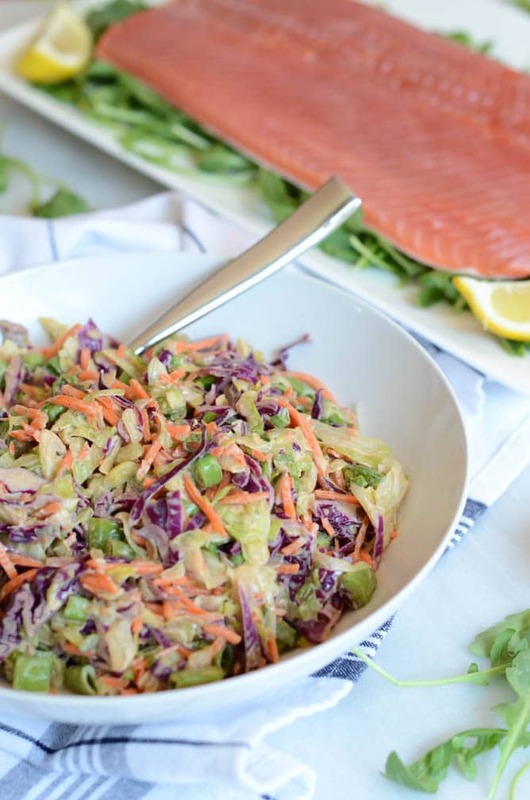 Me and this Lightened Up Miso Coleslaw certainly are. Well, not really. I’ve been jamming on a few work projects and fun social media takeovers coming up (be sure to follow @bloglovin_food on Instagram and keep an eye out for my takeover this weekend!!!) and also keeping busy on the social scene. Last night I attended a fun “Year of the Mule” cocktail competition in anticipation of Santa Barbara’s Fermentation Festival coming up in a couple of weeks here, and boy did I get to try some tasty mules! It certainly motivated me to get a mule cocktail recipe up on this here site, as I realize that I haven’t posted on yet! In any case, I’m finally (just now) starting to think about all of the foods I want to eat over this three-day weekend. Not going to lie, I feel like Labor Day weekend is the quintessential “end of summer,” even though in Santa Barbara the summer never REALLY ends and I know deep down that I’ll be enjoying beach days for many months to come. But, I still get the urge to grill out and gobble up all of the at-its-peak, end-of-summer produce in sight. Anyone else feel me on this? Anywho, the other week when I was making this delicious Whisky Gravlax, I started thinking about what else I could make that would go nicely with this in a summer-y, outdoor picnic-type spread, and I immediately started thinking about some sort of coleslaw. Here’s the rub though, folks, I’m not really that big of a coleslaw fan. Maybe it’s because I grew up associating it with tons of mayo and wilted vegetables, or just because there were too many watery tasting vegetables involved in general, but it was never quite my thing until I started enjoying the real good stuff garnishing delicious, non-vegetable foods like pulled pork sliders. So, I’ve finally gotten to the point where I’m willing to branch out and find at least SOME version of coleslaw that is (a) healthy and (b) tastes good enough that it does not need to be served with tons of juicy barbecued meat and smushed between a burger bun. 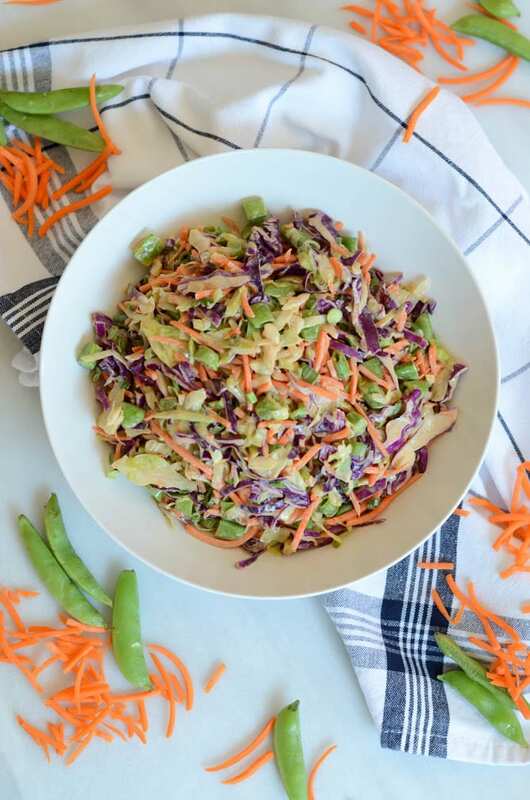 Enter, this Lightened Up Miso Coleslaw. The second objection I’ve been able to overcome is the inherent wateriness of most typical coleslaws. I’ve conquered this by using even amounts of the typical green cabbage and heartier purple cabbage, plus some shredded carrots for extra heft and good measure. But I couldn’t stop there, I had to throw in some of the crisp, fresh sugar snap peas that I had lurking around in my crisper drawer. No wateriness here! And tons of crunch….winning! 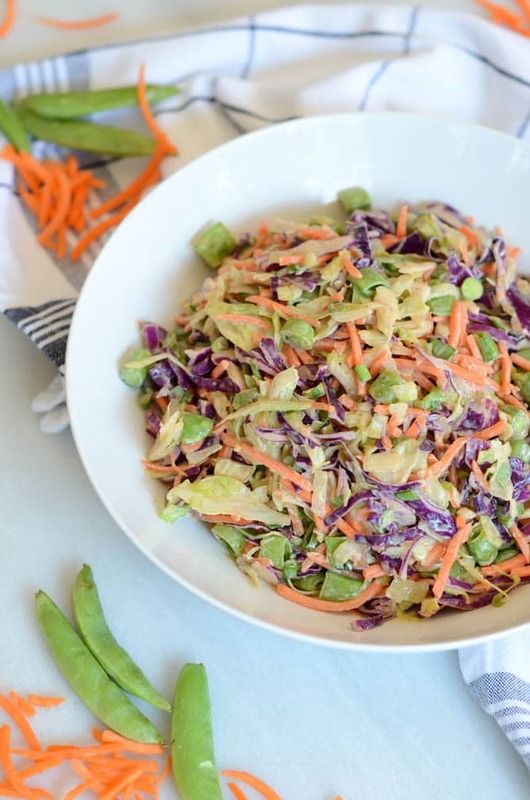 The other great thing about this Lightened Up Miso Coleslaw? It comes together incredibly fast. Let’s be honest, we all know that we don’t want to spend the majority of a three-day, end-of-summer weekend slaving in the kitchen all day. We’ve got to enjoy this pool and beach weather while we can! So grab all of your ingredients and whip this up in less than 20 minutes. No heat, no cooking time, no worries. We are going to take these last few days of gorgeousness by the horns and #weekend like the professionals we all know we are. And, don’t forget! I’ll have a fun and frosty cocktail up for you on Friday, plus this weekend I’ll be putting together a BONUS post featuring all of my favorite Labor Day-appropriate recipes on the blog! 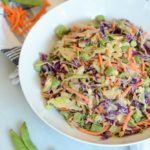 A lightened up, Asian take on the classic coleslaw recipe. Greek yogurt, rice vinegar, honey and miso add a tangy flair and sugar snap peas up the crunch factor of this popular cookout dish. In a small bowl, combine yogurt, miso, rice vinegar and honey. Set aside. 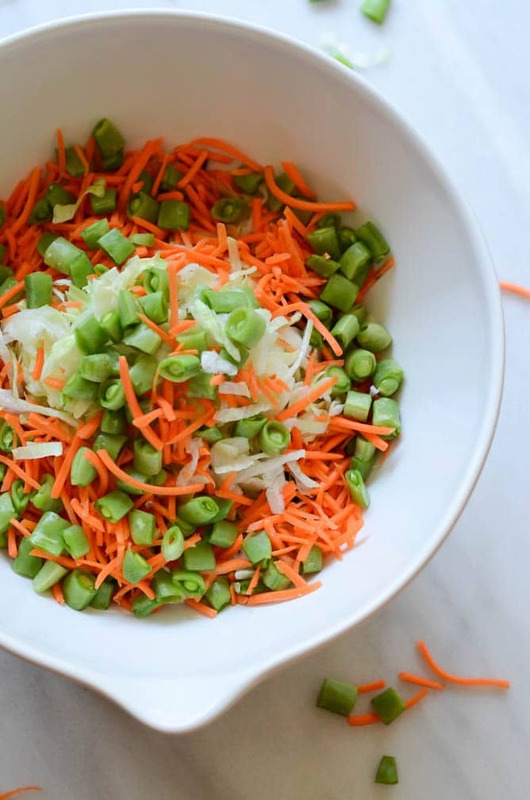 In a large bowl, combine both cabbages, carrots, snap peas and green onions. Pour yogurt mixture over cabbage mixture and stir to combine. Season with salt and pepper to taste. For best results, place (covered) in refrigerator for at least a half hour (up to two hours) before serving to let all of the flavors meld. *This post contains affiliate links. As always, all thoughts and opinions are my own. Get on up in this vegetable-y deliciousness.